Please consider donating to FABB tomorrow, Giving Tuesday. FABB has accomplished a great deal over the past 10 years as an all-volunteer group. We hope to increase our capabilities in the coming year and your tax-deductible donations will help us make that happen. Now that the Bicycle Master Plan has been formally adopted by Fairfax County, we will be working with the county to ensure the recommendations contained in the Plan are implemented. While the county is making progress on building bike infrastructure, more also needs to be done to educate cyclists and motorists and to encourage more people to take short trips by bike. Your tax-deductible donation can help us be more effective advocates for bicyclists. You can send a check to FABB, PO Box 3752, Reston, VA 20195 or donate online. Thanks in advance for your support. Beth Gamble, a resident of Burke, told FABB her commute to the Virginia Railway Express station benefits from a beautiful trail that runs from near her home straight to the station. Beth said she rides all around Burke, using the “great trails!” that run throughout the area. She likes being in nature and appreciates the fitness advantages of biking. Happy Thanksgiving and #OptOutside Friday from FABB! Hope everyone is having a good Thanksgiving. Some of you may have joined the Reston Thanksgiving Ride this morning. There are other opportunities to ride this weekend and avoid the shopping crowds, especially on what looks to be a great long weekend weather-wise. bikes@vienna's Black Friday Ride (via Meetup) - Riders are will depart from bikes@vienna on Friday at 10 a.m. They will proceed along the W&OD Trail to Herndon, returning to the shop for coffee and tea afterwards. Be sure to bring canned goods to Committee Helping Others. Spokes, Etc. Carl's Vienna Shop Ride - "Join Carl at the Vienna store for 20-25 miles of road and trail riding every Saturday morning! We will meet at the shop at 7:45am for a 8am roll-out and a 1-1.5 hour ride. Please join us! More information is available by joining the Vienna Shop Ride Google group. Please contact vienna-shopride@googlegroups.com to join!" The Bike Lane Saturday Rides - TBL sponsors two Saturday rides: WheelWomen Road Bike Rides, "a 20 mile ride women's road ride along the roads in Reston, VA. Our average pace is 12-15 mph and its a no drop ride;" and TBL Saturday Morning Road Rides, "a ride on the rolling roads of Reston. We average 17/18mph over 29 miles and travel through neighborhoods and on main roads. The majority of the ride is on the roads on rolling terrain with a few hills to climb." Both rides leave The Bike Lane at 9am. Performance Reston Saturday Ride - "A beginner level Saturday morning group ride, starting and ending at Performance Bicycle. The ride is for beginners, those getting back in the saddle, or riders who want to add some variety to their cycling. The ride will last approximately one hour, and will go at an average pace of between 12 and 15 miles per hour." Ride leaves at 9am. Also check the Reston Bike Club and Potomac Pedalers ride calendars for more rides. If you know of other group rides open to the public this weekend, use the comments section. If you are going shopping, consider doing so by bike. See the account of a holiday shopping trip in Fairfax posted on the WABA blog in 2013. Safety First, Expansion Later - Double Standard? U.S. Secretary of Transportation Foxx recently said that WMATA should fix safety problems with Metro before expanding. Imagine if that same logic applied to our roads. Each year nearly 300 people are killed on our roadways vs. about 1.3 per year killed in Metro-related incidents by my rough count. "the Department of Transportation will continue to restrict federal funding to Metro’s [regional DOT's] ongoing safety and state-of-good repair projects, not expansion. “When we are comfortable they’ve achieved levels of safety that are commensurate with what the traveling public should expect, and until that time they are going to be focusing on safety,” Foxx said. Foxx said expanding capacity eventually may be necessary, but federal funding will not start paying for new stuff until Metro [regional DOTs] fixes what it already has. “Over the long, long, long haul, this is a growing area and obviously there will be pressures on the system to grow in the future, but that future right now is far off because the focus needs to be on safety,” he said. Hat tip to GGW where I first heard this idea mentioned. At their October 22 meeting, the Reston Association Board of Directors voted unanimously to work with Fairfax County to remove snow on county trails in Reston. Many of those trails are used to access the Wiehe-Reston East Metro station. 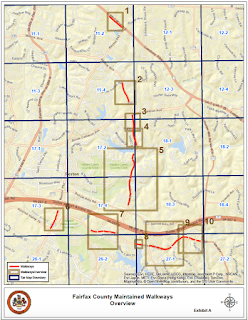 The RA Board agreed to "authorize Reston Association’s CEO to enter into trail maintenance agreements with Fairfax County Board of Supervisors and the Fairfax County Park Authority to provide limited routine maintenance on County-owned trails in Reston, subject to the review and approval of the Association’s land use counsel." According to the draft snow removal agreement (p. 117), RA will "provide routine maintenance on approximately 1.5 miles of County and Park Authority owned trails throughout Reston. Such routine maintenance will include general debris removal, minor asphalt patching, pruning/edge mowing, leaf removal as necessary, and snow plowing. In the proposed agreement, the County trails will be repaired before the Association accepts any routine maintenance responsibility (including especially problematic stretches such as those on Wiehle Avenue and Sunrise Valley Drive), and the County will be responsible for major repairs and capital replacement." (emphasis added). According to Reston Now, RA will cover the $15,000 cost for this routine maintenance. Reston currently spends over $800,000/year to maintain their 55 miles of trails. This year Fairfax County budgeted a measly $300,000 for "emergency and critical maintenance requirements for County trails (229 miles), sidewalks (425 miles) and (67) pedestrian bridges." Can't we do better than that? Is it any wonder that our exiting trails are crumbling and that almost none of them are plowed in the winter? Kudos to Reston Association for helping bicyclists and pedestrians safely reach the Wiehle station and other nearby destinations throughout the year. Fairfax County needs to fund basic maintenance of their trails and come up with a plan for clearing snow near important destinations such as activity and transit centers. NoVa Parks recently agreed to plow the W&OD Trail. It's time for Fairfax County to get with the program. Isn't it interesting how motorists refer to other motorists who obey the law with the denigrating term "Drive like Grandma." If you go the speed limit, stop at stop signs and red lights, and generally are a safe driver, then you probably drive like Grandma, and by implication, some people think that's a bad thing. I've noticed this when driving lately. Being sensitive to criticism about scofflaw bicyclists, and there certainly are some, I've become a more conscientious bicyclist. I've also decided to become a better driver, going at or near the speed limit, coming to a complete stop at STOP signs and before turning right on red lights, looking both ways for bicyclists and pedestrians. In other words, being a safer driver and doing what is taught in Driver's Ed. It seems the more I obey the law, the more upset motorists behind me get. People ride on my bumper, honk when I slow down to turn right, almost rear-end me when I come to a stop before turning right on red. Almost no one stops at STOP signs or before turning right on red anymore unless they absolutely have to. This behavior is very dangerous to pedestrians and bicyclists. As Fairfax becomes a more urban place, more of us are going to have to start "Driving like Grandma," and you know what, that will be a good thing. Please, Drive like Grandma. On December 8 the public will have an opportunity to speak to the Commonwealth Transportation Board (CTB) about plans for changes to I-66 inside and outside the Beltway. The meeting will be held at George Mason High School, 7124 Leesburg Pike, Falls Church from 6-8 pm. Cyclists are encouraged to attend the meeting and sign up to speak in favor of the proposed parallel trail and bike facilities on the rebuilt bridges. The parallel trail would be an extension of the very popular Custis Trail inside the Beltway. Information is not yet posted on the Tranform66.org meetings page but it should be there soon. See FABB's previous coverage of the project and info about our efforts to ensure that safe, convenient bike facilities are included. If the project goes forward, bicyclists should be able to travel safely along this congested corridor to commute and take short trips. The county Trails Plan and Bicycle Master Plan recommend including the parallel trail. It has also been endorsed by the Board of Supervisors. If you cannot attend the meeting you can provide comments at Transform66@vdot.virginia.gov. 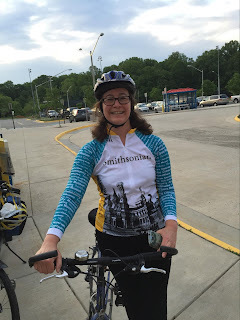 Sarah talked to FABB on Bike to Work Day 2015 while proudly wearing her BTWD t-shirt. She lives in Falls Church and commutes by bike to DC to her job in the NoMa neighborhood just north of Union Station. Sarah told FABB that she has been commuting by bicycle all around the DC metro area for many years. She said she loves riding and, in particular, loves the wind in her hair and how energized biking makes her feel. Sarah added that she would like to see improvements in the bicycle facilities for Rt. 7 from Tysons to Bailey's Crossroads. And, she would really like to have more protected bike lanes in Fairfax to make riding safer. As reported in the Post recently, Metro introduces free, covered and secured bike parking. The Bike & Ride parking at College Park will now be free with use of a SmartTrip card. Planned Bike & Ride facilities at East Falls Church and Vienna will also be free. Like the Wiehe-Reston East bike room, the fees to use the secure room were very affordable. Nevertheless, the fees and application process were a barrier to use of the room. Making the rooms more accessible should encourage more people to bike to the stations. At the Wiehle station, the free, covered bike parking just outside the secure room is usually filled to capacity. The bike room, while heavily used, has considerable room for additional bikes to be parked. We think the county will now face some pressure to follow WMATA's lead and make the Wiehle room more accessibly as well. It would no longer be a "secure" room since anyone with a SmartTrip card could enter, but most people lock their bikes in the room anyway. Cameras are located in the room which add a level of security if access is opened up. The Wiehle bike room isn't exactly secure now. Not long ago, on two occasions we were filming a segment on bike parking in the covered area outside the bike room. Within a few minutes security guards approached and asked what we were doing. They told us that several unlocked bikes had been stolen from the bike room recently. It's reassuring that they were keeping watch to ensure it didn't happen again. That was the first we had heard of the problem. We've been told by the county that they are working to make the room more secure. Police do report bike thefts. We have tried to get geo-referenced bike theft data but have not been successful, although we haven't pressed the issue. We know the data is available in The Daily Blotter published by Fairfax Co police. When we asked for a digital file we were told that the "police blotter is a report put together manually with the creator looking at the exact address and changing it in the Word document to a block number. This is not a field that is readily available." Sounds like the process could be relatively easily automated. If you'd like to volunteer to extract the bicycle theft data for the blotter, please let us know. The goal would be production of a map showing bike thefts in the county. Wouldn't you want to know where thefts are occurring? 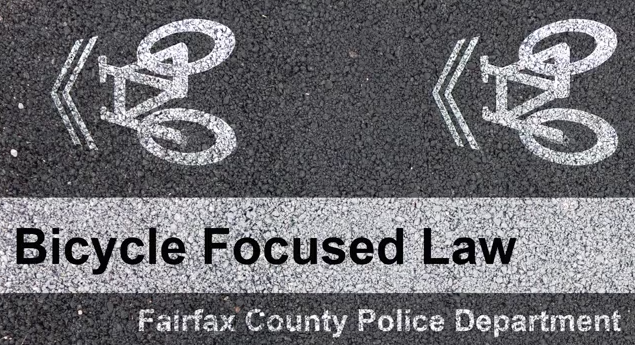 In 2013 FABB and WABA met with Fairfax County Police to discuss how we can work together to improve bicycle safety (see our Jul-Aug 2013 newsletter). In various previous encounters with police, members of FABB heard statements from police that concerned us regarding behavior of bicyclists and motorists, and about cyclists rights. We wanted to reach out to police to ensure rank and file officers were aware of Virginia law as it applies to bicyclists. At the meeting we agreed to work with police on production of a bicycle safety video to be shown to all Fairfax County police at roll call. Our goal for the video was to illustrate various aspects of Virginia law as it applies to bicyclists, focusing on those laws that are often misinterpreted. We hoped production of the video would lead to further cooperation with police and a better understanding by all police of bicyclists' rights and responsibilities. FABB would help with the script and we offered to provide locations and bicyclists to appear in the video. Shortly after that meeting we drafted a script that could be used as a starting point for the video. We based the script on what we thought was a very good police training video produced by Portland police in cooperation with their local bicycle advocacy group. Another good police training video was produced for Maryland police. We presented the script to our police contact and were told the script would need to be reviewed internally and they would get back to us. A year later, after numerous inquiries about the status of the video, we learned that police had a final script and were preparing to film the video. We did not review the script nor were we invited to participate in the filming. We were told we could attend the filming if we wanted. We were very disappointed with the final script. Rather than focusing on important concepts of bicycle law, the video concentrated on basic definitions and some minor aspects of the law as it applies to bicyclists, mostly unlawful cyclist behavior such has holding onto a moving vehicle, wearing earbuds in both ears, and carrying an object on the handlebars. We think one of the most important aspects of VA bicycle code is knowing where cyclists should ride when riding on the road. We are not required to ride to the far right, only as far to the right as is safely practicable. On a road that is too narrow to share with motorists, which is almost all roads in Fairfax County, bicyclists may ride even further from the curb, "taking the lane." This concept is only briefly mentioned and not illustrated half way through the video. Under a section labelled "Kiss and Ride" the video devotes over a minute explaining why it's ok for motorists to block a bike lane. There is almost no mention of motorist responsibilities such as stopping when turning right on red, obeying the speed limit, etc. There's no mention of common motorist actions that cause crashes. In response to this video we produced our own draft video that we hoped would be used by police to form the basis of a second video focusing on our concerns. We shared the video with police. The rough draft was sent to station commanders. Northern Virginia Transportation Commission is holding a meeting on Wednesday, Nov. 18 to discuss transit and other transportation options along Route 7 between Tysons and Alexandria. The project is known as Envision Route 7. 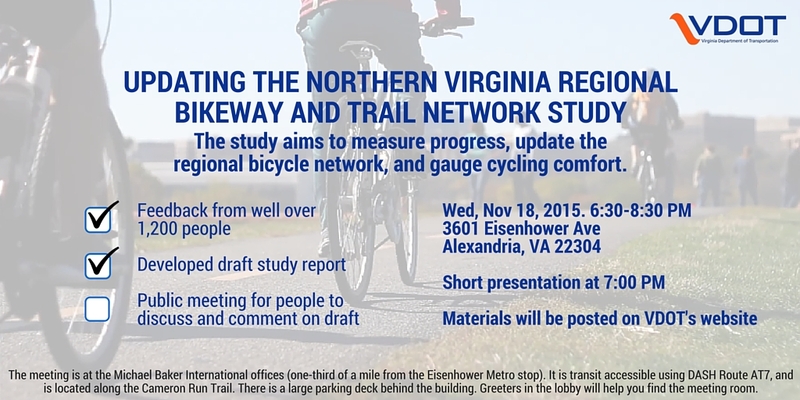 This is the same night as the NoVa Bikeway Study meeting and the FABB meeting. If you can't attend the Route 7 meeting you can submit comments using the Route 7 CrowdSource map. Several people have added comments about the need for better bicycle and pedestrian access along Route 7 for making short trips to Metro and other local destinations. It's called Leesburg Pike in Bailey's Crossroads, the site of Envision Route 7’s third and final fall public meeting on Wednesday, November 18. Stop by Glen Forest Elementary School between 7 and 9 p.m. to learn more about transit options for this historic thoroughfare and to help us determine what transportation will look like along Route 7 a quarter century from now. If you can't join us in Bailey's Crossroads, visit our website. There you will find a short video describing the study as well as an infographic summarizing the material from the previous meetings in Alexandria and Falls Church. Have something to say about the study? Use the CrowdSource map on the website and link your comment to a location along Route 7. Today VDOT received a National Roadway Safety Award for making Lawyers Road and Soapstone Drive safer by implementing a road diet that also created bike lanes. The Lawyers Road project was the first "road diet" in Virginia and has proven to be very successful. FABB was heavily involved in supporting the project. Congratulations to VDOT. Several more road diet projects were implemented this summer, in part based on the success of these two projects. (Washington, DC) -- During a national awards ceremony on Capitol Hill, the Roadway Safety Foundation (RSF) and the Federal Highway Administration (FHWA) today honored the Virginia Department of Transportation (VDOT) for its two Reston Road Diet projects, which were designed to increase safety by reducing the number of lanes on 2-mile segments of both Lawyers Road and Soapstone Drive in Fairfax County. Together, these projects jointly received one of 10 2015 National Roadway Safety Awards. These heavily traveled sections of roadway carry about 10,000 vehicles per day and were prone to excessive speeding. VDOT implemented the Road Diets by cutting the number of through lanes in half to two and adding a center turn lane. There was virtually no cost since the projects were implemented in conjunction with other paving projects. In addition, the extra width of the roadways were converted into bicycle lanes, building on the multimodal transportation network in the Reston area focused on improving safety and mobility of cyclists, pedestrians and motorists. Following project completion, crashes decreased by 69 percent on Lawyers Road and 67 percent on Soapstone Drive. Tonight VDOT is holding a meeting at their NoVa headquarters from 6-8 pm on prioritizing major transportation projects in the district. See the meeting materials, including a map showing the location of proposed projects and a list of the projects. Most of the projects involve widening major roads. Comments are being accepted until Dec. 11. Six-YearProgram@VDOT.Virginia.gov. All projects should include safe bicycle facilities. You are invited to share your input on transportation improvements during pub- lic meetings held by the Commonwealth Transportation Board. The meetings will begin with an open house, displaying a list of proposed local and regional projects that will be scored through a new prioritization process under a new law called House Bill Two (HB2). The open house will be followed by a town hall session, where you can engage in discussion and ask questions about the projects. There will be no formal comment period. Monday, November 16, 2015, 6-8 p.m.
Derek from Burke was kind enough to pause in his commute on Bike to Work Day to answer FABB’s short survey. This speedy biker was direct and to the point. FABB: Where do you ride? Derek: Widen the shoulders on area roads. U.S. DOT Secretary Foxx recently spoke at a transportation conference in Virginia according to an article in Inside Business entitled U.S. Transportation Secretary Anthony Foxx: South needs detour from relying on road expansions. Noting that the population of the southeast is projected to double by 2050, Secretary Foxx said we must have multimodal solutions for our transportation problems, with roads, public transit, good walking environments and good land planning included as part of the equation for every community. “We can’t build enough roads to solve our transportation problems. We can’t widen enough.” And if roads are the only solution, “the South is going to be stuck in traffic. Period. Congressman Earl Blumenauer recently responded to a Washington Post op-ed Our political divide on transportation in which the author of the op-ed invents what he calls the "congestion lobby" which he claims is fighting road expansion as part of a campaign of "social engineering: getting people out of their soulless single-family suburban homes and into vibrant multiethnic communities; having them ditch their environment-destroying SUVs in favor of sustainable light rail; and supporting the urban disadvantaged instead of a privileged suburban class." What the author neglects to mention is that we in the US. have been socially engineered since the 50's with massive publicly subsidized highway and road construction, home-loan guarantees, and the mortgage interest deduction that facilitated suburban sprawl. With almost no other options to safely walk, bike, or take transit, most people have no other choice than to drive, even for short trips. In his Nov. 6 Washington Forum commentary, “Our political divide on transportation,” Robert D. Atkinson ignored the biggest trend in American transportation: a desire for options. There is no pro-car vs. anti-car battle being waged through social engineering. Instead, there is a national movement for transportation choice led by millennials with no addiction to car use and graying baby boomers who are recovering from theirs. Younger Americans don’t just drive less — many choose not to have driver’s licenses. They would rather spend their time and money on technology and experiences. They use cars without being tethered to them. Increasingly, many prefer biking, taxis and ride-hailing services and mass transit. Their baby-boomer parents and grandparents are finding the car-dominated lifestyle in which they grew up to be increasingly unsatisfying. They, too, are moving to urban neighborhoods and reducing their automobile use. Clearly, not everyone has abandoned motor vehicles. Some prefer to drive everywhere and don’t mind the time and expense. Because so many communities surrendered to the car long ago, too many Americans have no real choice. Those who do have choices, young and old, are opting for the balanced transportation systems of livable communities that look nothing like Mr. Atkinson’s view from the 1970s. VDOT is holding a series of meeting on proposed transportation projects in Northern Virginia region. Most of the projects in Fairfax County involve widening of major routes such as Routes 1, 7, and 28. See the full list of projects (search for Fairfax County). The Fairfax meeting will be held on Monday, November 16 at VDOT's NoVa Headquarters. 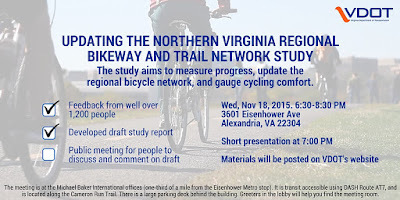 A draft report has been completed for VDOT’s update to the NOVA Regional Bikeway & Trail Network Study. During this effort the study team received feedback from well over 1,200 people through an online survey. The meeting will take place at the offices of Michael Baker International. Greeters in the lobby will help you find the meeting room. Please feel free to distribute the attached advertisement to anyone who might be interested in attending. We hope to see you on November 18! One of FABB's goals over the years has been to help remake Tysons from a suburban, car-dominated place to a more walkable, bikeable community. In Sunday's Washington Post article U-Va. professor takes steps to measure Tysons’ path to a pedestrian paradise a UVA professor and his students document walking conditions in a part of Tysons. As anyone who has tried to walk and bike in Tysons lately, it's a challenge. A major transformation is happening in Tysons and Tysons is a test case. If Tysons can be remade into a livable community it can set the standard for other similar communities to follow. Many people are watching this transformation, hoping that if it's successful in Fairfax, it can occur elsewhere. Conversely, many people think there are too many obstacles to overcome. Fairfax and VDOT need to have a greater sense of urgency about improving biking and walking conditions in Tysons. We've been impressed with progress made this summer with over two miles of bike lanes created in Tysons. However bike connections to the stations are still poor and walking conditions are worse. Changes immediately around the stations should have been made BEFORE the stations opened. As it is, it will be years before basic ped infrastructure is in place. We know the county and VDOT are trying to respond; they need to do what is necessary now to make the changes happen sooner. "In addition to the four Metro stations, the plan to remake Tysons Corner includes 36 million square feet of new development — a mix of office, retail and residential. The hope is to add parks, bike paths and plazas, giving residents places to gather and move about without needing a car. But whether the ambitious plan can be realized remains to be seen. Tysons’ makeover could be a model for other auto-dependent developments, or it could be a cautionary tale." 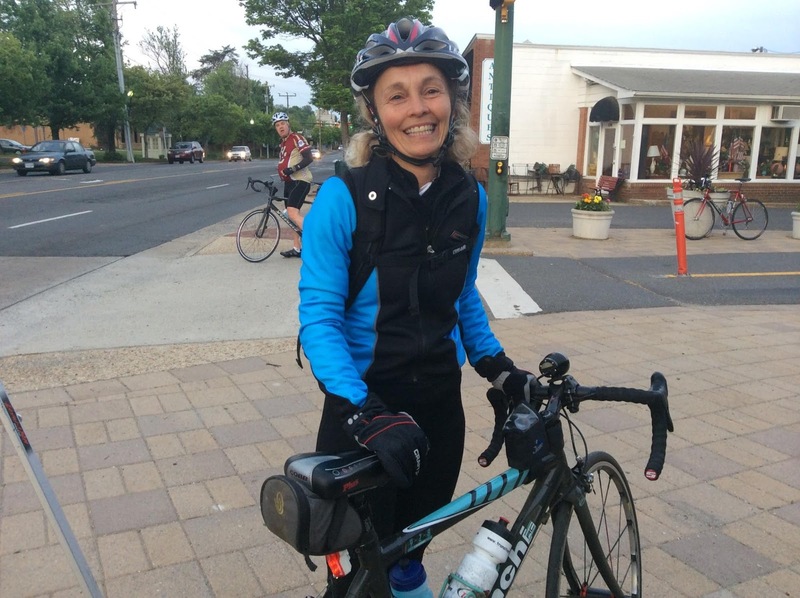 On Bike to Work Day 2015, Melissa England spoke to FABB at the Vienna pit stop, briefly interrupting her commute from Leesburg to her job as a contracts manager for a major defense industry corporation in McLean. Melissa said she rides because she hates highway traffic and loves being outside. 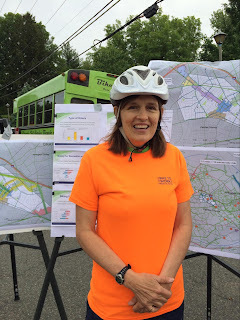 She would like to see more bike lanes in Fairfax County to help make commuting safer. Ghost bikes are memorials to cyclists killed while riding their bikes. Genea Barnes is a photographer who visited Ghost Bike sites around the U.S. She recently published the book Don’t Forget Me, an art book memorializing Ghost Bikes. Brooklyn, October 21, 2015 - Photographer Genea Barnes is releasing an art book featuring her Ghost Bike art. Ghost Bikes are bicycles that have been painted white and placed near a location where a cyclist was killed. Barnes has traveled to over 50 cities photographing these bikes. The book has two parts. The first part chronicles her travels with journals and snapshots of the bikes. The second part displays Barnes's memorial art: Ghost Bike images, and photo montages that combines the Ghost Bike images with studio-shot models to represent fallen cyclists. The book is 10.25in x 10.25in x 0.75in, and is 143 pages. Each year, the US sees more than 600 bicyclist fatalities, and more than 50,000 bicyclists report injuries. Ghost Bikes symbolize the need for drivers and cyclists to be more aware of their surroundings. Barnes lives in Brooklyn, New York and is from San Francisco, CA. In 2010, San Francisco Bay Guardian readers voted Barnes best emerging artist. She has exhibited her photography in world class art hubs like New York, San Francisco, Los Angeles, and Milan. Her current projects explore death, decay, and facets of what is left behind. On November 3, all members and the Chairman of the Fairfax County Board of Supervisors are up for re-election as are all members of the county School Board. FABB recently sent questions regarding bicycling in Fairfax County to candidates for the Board of Supervisors and a separate set to candidates for the School Board. We received responses from 12 of 19 Board of Supervisors candidates and 19 of 24 School Board candidates. See the Board of Supervisors candidate responses and the School Board candidate responses. All Board of Supervisors candidates who responded agreed with the statement "Do you support safe bicycling as an integral part of the overall transportation options in Fairfax County." Three quarters or 75% of respondents said they support implementing the Bicycle Master Plan recommendation to "Allocate an annual budget dedicated to bicycle planning and program initiatives." All School Board candidates who responded to the survey generally agreed with the statement "The school system and school board should be doing more to enable FCPS students to walk and bike to school instead of driving or being driven." FABB does not endorse candidates. We provide the information so that you can better understand candidates' views on improving bicycling in Fairfax. On October 27, the Virginia Commonwealth Transportation Board approved the latest plans for the widening of I-66 Outside the Beltway. The plans include the parallel trail that will serve as an extension of the very popular Custis Trail, which is located inside the Beltway. The rebuilt bridges also will include new ped/bike facilities. We are very encouraged that the parallel trail is now included as an integral part of the project and that most of the ramp crossings are grade-separated using either bridges or tunnels. Unfortunately much of the trail is located on the highway side of the soundwalls, mostly due to opposition from residents living adjacent to I-66, particularly in the Dunn Loring area. As the project moves forward we hope residents will begin to understand the major benefits of having access to this trail and that the final design will be modified to reflect that support. Fairfax County recently named Adam Lind as the new Bicycle Program Manager, commonly referred to as the Bike Coordinator. Adam has been serving as the acting Bike Coordinator since Charlie Strunk retired in January of this year. Congratulations Adam! Adam has done a great job as acting coordinator, working with VDOT on the creation of more than 34 miles of new bike lanes as part of this summer's repaving program. The work included conducting numerous meetings around the county to seek comments on individual projects. He is developing a plan to implement bike sharing in Reston. Most recently he has worked with VDOT on the design of the I-66 parallel trail and other bike facilities related to the project. See the FABB blog for more info on Adam. 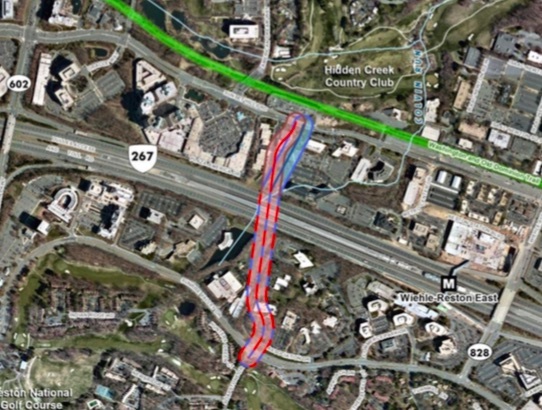 Last week Fairfax County presented the latest plans for the Soapstone Connector, which will extend Soapstone Drive from Sunrise Valley Drive to Sunset Hills Road across the Dulles Toll Road. With limited crossings of the Toll Road, intersections around the Reston Parkway and Wiehle Ave. crossings become very congested during rush hour, making them especially dangerous for pedestrians and bicyclists. The Soapstone Connector will provide a new way for cyclists and pedestrians to safely cross the Toll Road and access the Wiehle-Reston East Metrorail station and other destinations on both sides of the Toll Road. Bike lanes are included in the project and serve as an extension of the current bike lanes on Soapstone Dr. Unfortunately the proposed road will extend only to Sunset Hills Road on the north where no bike facilities exist. The W&OD Trail is located a short distance north of Sunset Hills Road but there are no nearby connections to the Trail. Please contact the county and ask that a connection to the W&OD Trail be included in the project. Deadline for comments is November 6. Email comments to audra.bandy@fairfaxcounty.gov. Fairfax Co. Park Authority has proposed to pave a section of the Cross County Trail through Wakefield Park. The trail is heavily used by commuter and recreational cyclists. The unpaved trail is in poor condition and is difficult for most transportation bikers to navigate. A paved surface will be easier to maintain and would provide a much better surface for most trail users with minimal adverse effects on the environment. 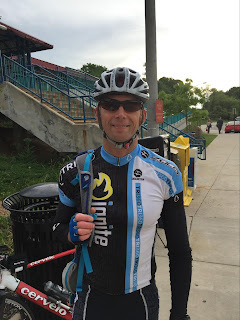 Cyclists are encouraged to send a message to Project Manager Bill Boston, William.boston@fairfaxcounty.gov, to voice support for paving the trail segment. See the FABB blog for more info. 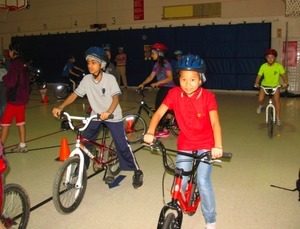 Using Safe Routes to School grant funds, Fairfax County Public Schools (FCPS) has purchased 30 bikes and 6 Strider bikes for bicycle safety lessons at elementary schools. Week-long lessons were conducted at 12 elementary schools last spring for grades 4, 5, and 6, reaching over 8,000 students. Students at several more schools received lessons this fall. Additional grant funds will be used to purchase more bikes to expand the bike program to middle schools. Lessons include bike skills, safety education, signaling, and road simulation riding. Elementary schools where classes have been held include: Island Creek, Kings Glen, Rolling Valley, Stratford Landing, Washington Mill, Greenbriar West, Lane, Hollin Meadows, Canterbury Woods, North Springfield, West Springfield, Colin Powell, Fort Hunt, Hunters Woods, and Rose Hill. Kudos to Sally Smallwood, FCPS SRTS Coordinator for implementing this program. We hope the program can grow in the near future to allow all elementary students to learn safe bicycling skills. See the Fairfax SRTS Newsletter for more info. Fairfax Water recently replaced a major water main adjacent to Fairfax County Parkway. Major construction work required removing and relocating the Parkway trail. Fortunately, Fairfax Water provided a paved detour throughout the long construction phase, which lasted for several years. In October, construction was completed and the original trail was replaced and opened. We want to thank Fairfax Water for their diligent efforts toward maintaining trail access during the construction period. November 18, Wednesday - FABB Monthly Meeting in Vienna at 7:30 p.m.
December 16, Wednesday - FABB Monthly Meeting at Mosaic District at 7:30 p.m.
December 19, Saturday - Tour de Lights in Reston, 4:30-6 p.m. 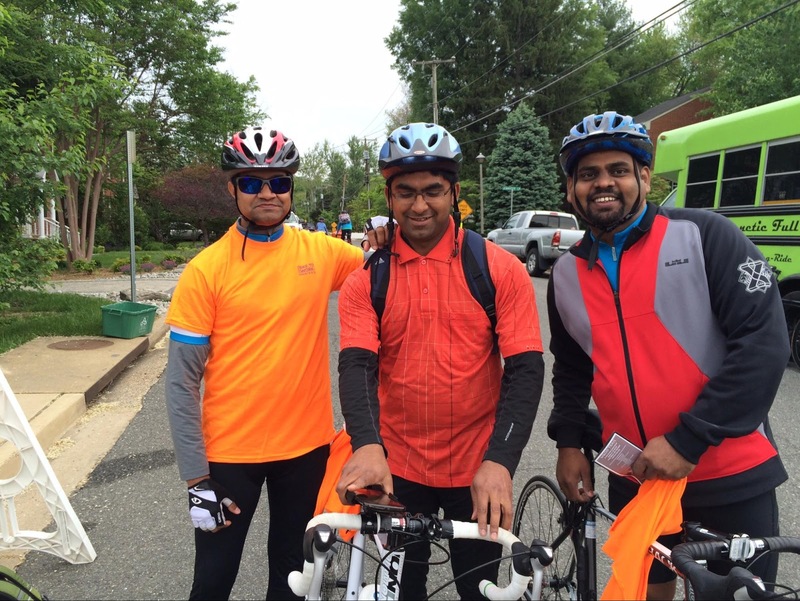 These three friends were riding from Falls Church to DC on Bike to Work Day when FABB spoke to them. All three love biking and think that more trails like the one that runs through the W&OD Regional Park would make for a less dangerous and more relaxed commute. 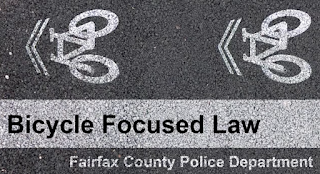 FABB continues to work with Fairfax County to implement the county’s Bicycle Master Plan, which includes recommendations to expand on-road and off-road facilities as part of a larger bicycle transportation network that will make Fairfax County more bicycle friendly. As we mentioned in an earlier blog post, the Turner-Fairbanks Highway Research Center is conducting a study on bicycle signals and signs. Researchers are still looking for bicyclists to help with the study. I recently participated in the study. Participants are shown a road with bike lanes at an intersection. You will be asked your opinion about several bicycle directional signs and signals. It's a painless process and you are paid for your time. The study will likely continue through November. EARN CASH AND HELP RESEARCHERS MAKE BICYCLING SAFER! We are currently researching the design and implementation of bicycle traffic signals and signs intended to improve the safety of the bicyclist when at an intersection. We really value your opinion as a bicyclist. A typical study lasts 1 – 2 hours.